I keep telling myself I'm going to post on LJ more but I just...don't! Ugh. I'm pretty addicted to tumblr and twitter and that's eating up my internet time. However, I'm trying to go a whole week without using either site so maybe I can spend more time here? Here's hoping! 2012 was an interesting year for me. In some ways it was one of the best years of my life but it was also the worst. I was suicidal many many times in 2012 and my depression was out of control. 2013 hasn't started out well in that department. I'm hoping to find a medication cocktail that works. Last August was the best August of my life. 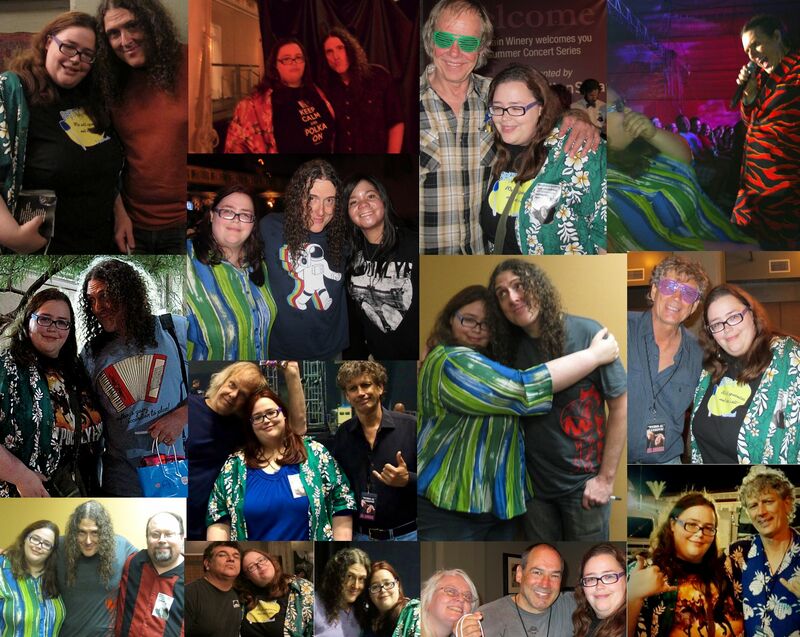 I went to six Weird Al concerts in that month alone. I got to see Al after each show, it was wonderful! In October I went to my very first con; GMX in Nashville. I met Doug Walker who I adore and made some new friends! In December I saw Steam Powered Giraffe in concert for the first time. SPG is a really great band that I recently discovered. They're singing automatons! Go check them out on youtube. This year I'm hoping to go to more cons. My mother and I are also looking into going on an Italian\Greek cruise in September. In November I'm planning on going back to GMX. The last year has been hectic. I've been fighting my depression and trying to keep myself busy with traveling. I want a job but...I just can't. The idea of a job fills me with horrible anxiety. I hope one day I can have one but right now I have more important things to worry about; my health. I've gained so much weight this last year, I'm at a very scary weight. I'm in the process of joining a program that will prepare me for the surgery. I hope I can make it that far because my insurance won't let everybody have the surgery. I need it...nothing has been working and I'm terrified that I'll die before I hit 30. I've been doing some traveling. I went back to the UK last July as well as June of this year. Last year I went with one of my best friends and this year I went with my mother. This time next month I'll be in London again, I can't wait. Life has been quite...interesting. I've had horrible days where my depression took over but I really shouldn't complain. I have a fairly good life, supportive friends and semi-supportive family. I've met both of my heroes in my life and I have wonderful friends. I was financially sound to splurge on myself. But unfortunatly I used buying things as a medication for my depression and it cost me. I'm not broke but I can't afford to splurge anymore...and yet I do. I'm getting better, I'm forcing myself not to buy things I don't need. I'm forcing myself but it's hard. It's sort of like eating with me, I eat as a medication...both are destructive but I'm fully aware my overeating is more harmful than my spending. I'll be in the UK from July 1st to July 17th, it's a longer trip than 2009. I'm going to some new places this time! I'll be in the same places as last time; London, Edinburgh, Bath, Lacock, Stonehenge, Glencoe, and Paris. But this time I'll also be on the Isle of Skye and in Glasgow! This time I'm going with one of my best friends and I'm so so thankful for that gift. During my last tour I made a wonderful friend in Monica. I still talk to her all the time and I love Monica, she's an awesome person. I hope my best friend and her hit it off, I'm sure they will! Oh yeah, Monica will be going on the trip again if you couldn't tell. While in London I plan on doing some of the same things but I'll also be doing new things. I'm going to the Doctor Who Experience, Much Ado About Nothing, the Museum of Natural History, and hopefully the Eye.